Out back in the winter. Enjoy a walk and come back in to warm by the fire. Out back in the summer under a canopy of oak trees and stars. The Tavern Room is getting a facelift with beautiful Cherry panels. Lathrop manor is proud to offer the Tavern Room; the perfect escape in the fall with the roaring fire and the football game on the tv, the room draws you in. The Living Room gets brilliant morning light. It's a comfortable setting to enjoy another cup of coffee and read the paper. The handsome and one-of-a-kind Dining Table is made by hand from 250 year old Chestnut floorboards. 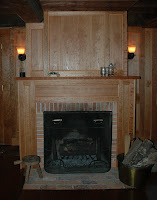 The Plank Room is named in honor of the owners and caretakers, Steve and Judy Plank, from 1970 until 2005. Comfortable room with a view of the Meadow and the sound of the Mourning Doves, complete with a fireplace. This room's romantic four-poster king-sized bed boasts wonderful afternoon light. Named for the four generations of the Lathrops, the early owners and proprietors of the home. 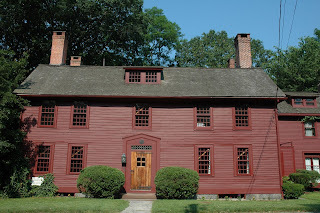 Lathrop Manor, one-time residence of Samuel Lathrop, Dr Daniel lathrop, who with his brother started the first pharmacy in Norwich and employed the young Benedict Arnold. The room is spacious and warm, enjoy the peaceful, comfortable, romantic setting from a majestic king-size bed. The Lathrop Room is resplendent in morning light and a wonderful backdrop for a private breakfast. It offers panoramic views of the other historic homes within the District, as well as the 15 acre Meadow. 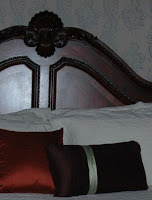 We are proud to offer Lathrop Manor now as a Bed & Breakfast. The private residence since 1744 is a beautiful example of a center hall Colonial with seven fireplaces. 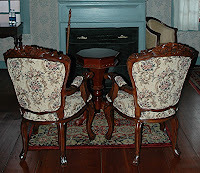 Samuel Lathrop built the house in the early 18th Century but it was met with a fire. The house was rebuilt and enjoyed by Dr Daniel Lathrop, a successful Pharmacist who is credited with employing the young Benedict Arnold. The house, nestled in the center of the Norwich Historic District has a rich history and beautiful craftsmanship from the hand carved wooden beams to the wide board flooring throughout. It is inspiring to imagine the lives of those who have walked these halls before.